Be the first to share your favorite memory, photo or story of Anniebell. This memorial page is dedicated for family, friends and future generations to celebrate the life of their loved one. Anniebell Jenkins, daughter of the Late Horace and Letha Jenkins, was born September 27, 1957 in Newark, NJ. God called her home in the morning of October 26, 2018. Anniebell graduated from Barringer High School in Newark, NJ. She worked as a day care giver, at Sears Department Store and at New Jersey PAC in downtown Newark, NJ. Anniebell was a loving and dedicated mother to her children. She also loved to play BINGO, dance and sing. Anniebell leaves to cherish her memory: her two children, Bernard and Angel Jenkins; four grandchildren, Khali, Khalisha, Tarae and Bryce Jenkins; and her great grandchildren, Noah and Ka’mariana Stephens and Ja’cari Quarles. 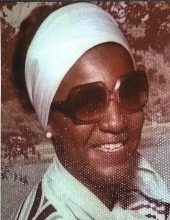 She leaves to mourn her passing: her two sisters, Rose Merritt of Willingboro, NJ and Pinky Jenkins of Newark, NJ; along with her sister-in-law, Donna Jenkins of East Orange, NJ. She was preceded in death by five brothers, Charles Robinson, Gordon, Jessie, Thomas and Horace Jenkins; and two sisters, Sarah Griffin and Adelle Green. This Online Memorial has been created to commemorate the life of Anniebell Jenkins. Leave a message on the Tribute Wall to share your favorite memories and offer words of sympathy and comfort. To send flowers or a remembrance gift to the family of Anniebell Jenkins, please visit our Tribute Store. "Email Address" would like to share the life celebration of Anniebell Jenkins. Click on the "link" to go to share a favorite memory or leave a condolence message for the family.